I do not own this site, I am selling it on behalf of one of my staff at my agency. ​.com TLD, 10 letter 2 word, (non-premium) brandable domain. It's in the tech niche, mostly targeting mobile, download and how-to related keywords. ​The site has 175 indexed pages in Google. The content was wrote by the creator, who is an Indian with English language schooling - The quality isn't high, but equally isn't low. The site was hit by the "Fred" update in March, due to a lack of overall topical relevancy and general thin content - There are some pages that are completely unaffected, whilst a large number of them saw a significant drop. Some pages are 900 - 1,400 words, whilst others barely hit the 500 mark. This site's link profile is actually extremely small, and uses ZERO black hat links - No PBNs, No Spam etc.. The creator of the site did a custom outreach campaign and created 10 decent quality guest posts that link to various pages of the site.​ The creator has also built a few forum links, on related forums to related pages. The site has also acquired a number of organically created social links, such as scoop.it and has been featured in a round-up in EnGadget, as well as natural links from the Sony Community forums, Bandcamp and others. Since being hit by the "Fred" update (core algo, that affected niche relevancy/thin content sites) the site's traffic has dropped to 1,000 visitors per day, down from around 3,500 - 5,000 previously. 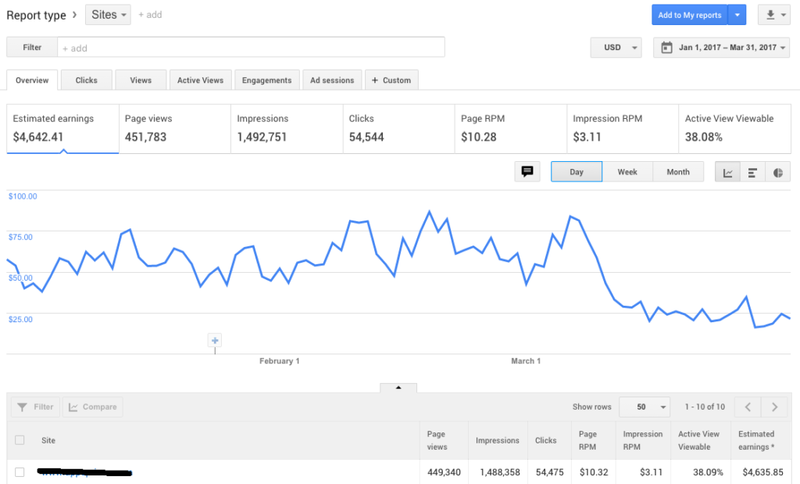 ​Note: The bounce rate is broken due to Analytics updates, the true bounce rate is around 39%. ​Likewise, as a result the earnings for the site has dropped due to the traffic dropping.. It did $540 in April, down from about $1,500 - $2,000 in previous months. All this site really needs to recover from being hit by the update is content expansion on pages that saw drops (which is very easily determined in analytics) and more topical relevancy - Currently, the site's topics are a bit all over the place.. If you cut out the under-performing pages, added new content and started a proper topical campaign it'd likely flourish back to what it was previously doing or higher. ​Interested in purchasing this site? PM Me on Facebook Here. Looking for offers around $6,500 - $8,000.